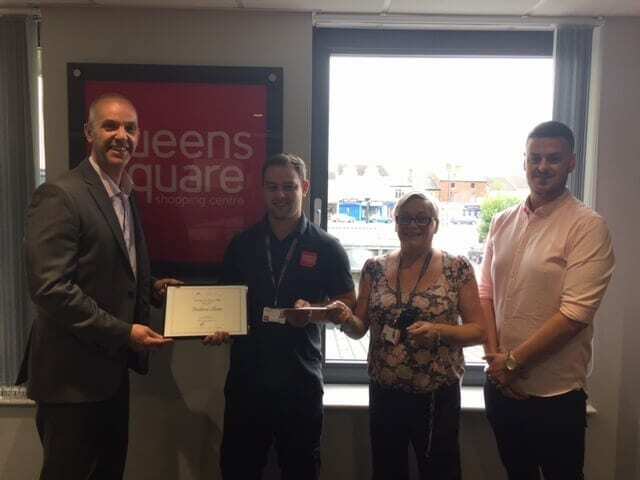 We were delighted to present Andy Shaw, one of our cleaning operatives at Queens Square Shopping Centre, with a much deserved token of our appreciation. Andy was recently instrumental in helping to save the life of a 2 year child who was choking and in serious distress. His prompt actions in immediately recognising the seriousness of the situation and alerting one of the security team, Jas, to administer life saving first aid were pivotal to achieving a successful outcome of what was a potentially life threatening situation. Andy was recognised with a certificate for Going the Extra Mile and a £50 voucher as a massive thank you. He is pictured receiving his certificate from Alistair Clayton, Commercial Director, his voucher from Deb Doody, Aston’s Site Cleaning Manager with Aaron Powell, Centre Manager, also taking time out from his busy schedule to reiterate his thanks to Andy.